Adorable purity of very beautiful lucky flower. White Rose is showing the remarkable multi layers of gorgeous bracts very nicely. In a memory of Rose, last outer bracts are biggest while inner bracts are smaller inwards consequently. As appearance of white rose, the center bracts display like the rose bud and then in blooming stage at the same time. There is very light green line running along the edge of bracts while also become more intense green at middle bracts area. Flowers are in very big cluster. 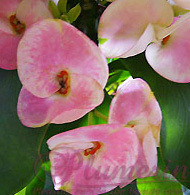 Very lovely and sweet lucky plant with light pink spreading all over on white background flower. More intense pink at the rim of bracts. Having buttercup-reddish centered and oval bracts in well-balanced shape, appearing in cluster of 8-12 flowers produced all year round. Flower Size : 2-3 inches. Extremely rare and remarkable characteristics of Zonya, showing the outstanding double layers of double pairs of conspicuous petal like bracts very beautifully. 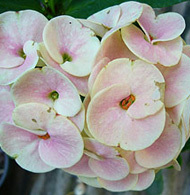 With sweet pink colored of outer bracts which support the lighter pink inner bracts looks very well-balanced of beauty. Outer bracts are two times sizes of inner bracts. Very clear and intense pink veins spreading all over petals. Flowers are overall in double layers shape of buttercup and are clusters around 10-12, producing flower all year round. Keeping quality is very good and long lasting. Super rare and remarkable characteristics of Variegated E.milli, displaying the well-balanced of double pairs of conspicuous petal like bracts very beautifully. Bright red colored of bracts which strongly support the variegated leaves of this rare variety, looks very contrast but perfect. Producing flower all year round. Keeping quality is good. Flower Size : 3-4 inches. The latest and super rare variegated leaves of E. mili is available with a stunning images of variegated leaves in narrow shape and linear of very sharp tips. 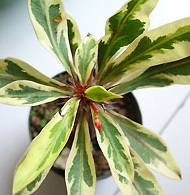 The well-balanced colors of variegated leaves are showing in white at the edge supported by the dark green and slightly shade of greenish at the middle of leaves vein. 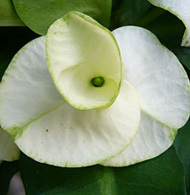 Flowers are of pairs of conspicuous petal like bracts very beautifully. Bright red colored of bracts which strongly support the variegated leaves of this rare variety, looks very contrast but perfect. Producing flower all year round. Keeping quality is good. Nice light pink flowers, slightly thick bracts with well balance of a pair of kidney-shaped. One side of each bract is twisted over another and in light pink colored all over as beautiful background. At the edge of each bract, there is very light green line running along partially. Also, there is very light green of vein spreading almost invisible all over pink bracts. Having a buttercup-orange gold centered of flowers. Flowers are so crowded and appear in big cluster. Having flowers produced all the year around. 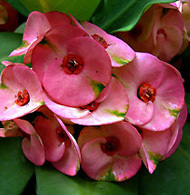 With a remarkable ruby flower, tiny, thick bracts and surrounded by a pair of kidney-shaped. Having touch of tinted greenish at two sides of the rim while also well centered by a spot of intense red. An extraordinary inflorescence of 8-15 flowers produced all year round. 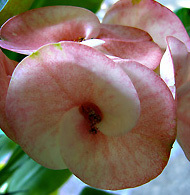 A notable peach pink flower, with very thick bracts and well-balanced of a pair of kidney-shaped. Each bract is twisted and spiral at the same time. At the edge, it appears the big band of intense pink color running along. The light pink colored spreading all over flowers while also having slightly green veins as nice texture and perfect background. Size of 8-12 flowers, very crowded and in cluster produced all year around. 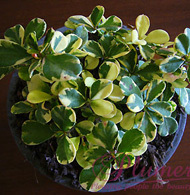 Extremely sweet variety of lucky plant – Valentine, showing light pink spreading all over on white background. 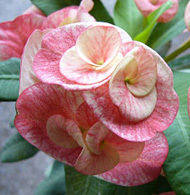 Bracts are little wavy and backward at the edges, having slightly tinted green colored and line pink running along at the bracts rim. 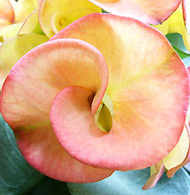 Flowers are overall in double layers, outer bracts in light pink while inner bracts come in tiny curved shape and in light yellow very nicely. 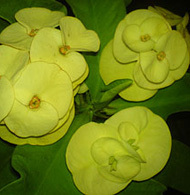 Flower in dense cluster. Flower Size : 3-5 inches. Super rare to be available of remarkable characteristics of Wanaree, showing the outstanding double layers of double pairs of conspicuous petals like bracts very beautifully. With charming bright yellow colored of outer bracts which support the overall outlook very well-balanced of beauty while also having orange-golden eye at the center of flower. Outer bracts are around three times sizes of inner bracts. Flowers are overall in double layers shape of perfect blooming shape and are clusters around 10-12, producing flower all year round. Keeping quality is very good and long lasting. If you have any inquiry or comments, please welcome to contact us at plants@plumerin.com Your e-mail will be read and responded within 24 hours.